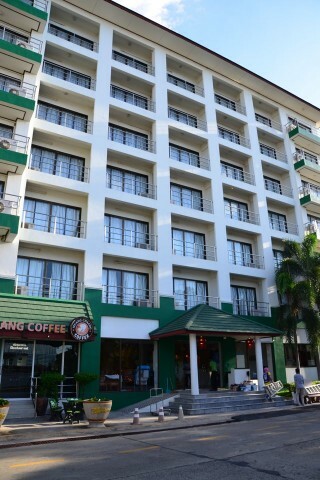 Located just off Lak Mueang Road and a five-minute walk southwest of the market, the Maneerote is a fairly large hotel with huge, fresh smelling rooms and a lift at budget prices. Though lacking in character, rooms are airy, bright, spotless and equipped with firm but comfortable beds, TVs, fridges, desks, large mirrors, free WiFi that works great, bureaus and spacious balconies with large sliding glass doors. Standard rooms will be fine for most, but we’d shell out the extra 50 baht for a corner superior with a wraparound balcony affording views over most of Surin. The standard bathrooms with curtained-off hot-water showers wouldn’t be out of place in a 2,000 baht room in Bangkok. In fact, we found the 450 baht rooms at Maneerote to blow the 700 baht rooms at Phetkasem Grand away, although Maneerote doesn’t have a pool and breakfast is not included. Staff is welcoming and there’s a small computer station and coffee shop serving decent breakfasts for cheap. Renovations were being done when we last passed through. There’s also a large car park in case you have your own wheels. Maneerote is a popular spot that’s often near capacity; in that case you might try TK Mansion to the west of Nong Yao Park.